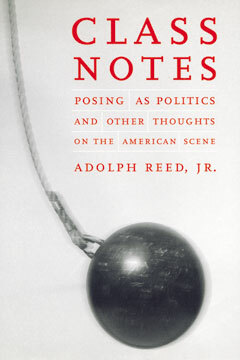 Hailed by Publishers Weekly for its “forceful” and “bracing opinions on race and politics,” Class Notes is critic Adolph Reed Jr.’s latest blast of clear thinking on matters of race, class, and other American dilemmas. The book begins with a consideration of the theoretical and practical strategies of the U.S. left over the last three decades: Reed argues against the solipsistic approaches of cultural or identity politics, and in favor of class-based political interpretation and action. Class Notes moves on to tackle race relations, ethnic studies, family values, welfare reform, the so-called underclass, and black public intellectuals in essays called “head-spinning” and “brilliantly executed” by David Levering Lewis.